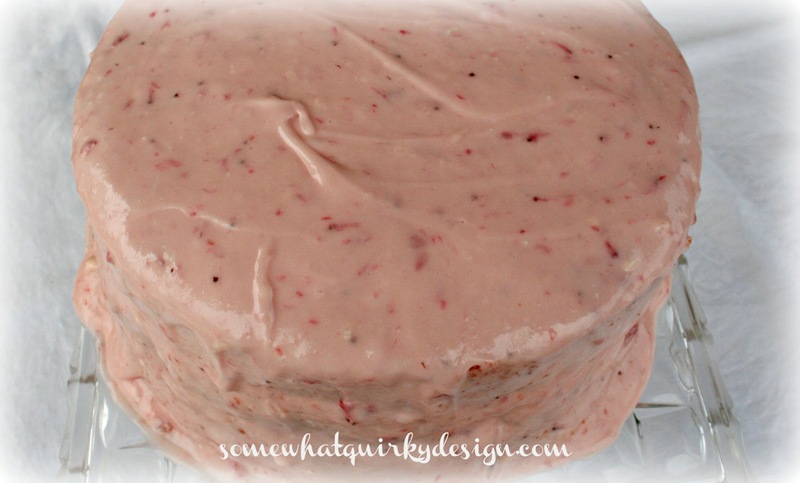 Somewhat Quirky: This IS A Recipe For Cake! This IS A Recipe For Cake! There will be no green beans in this post. 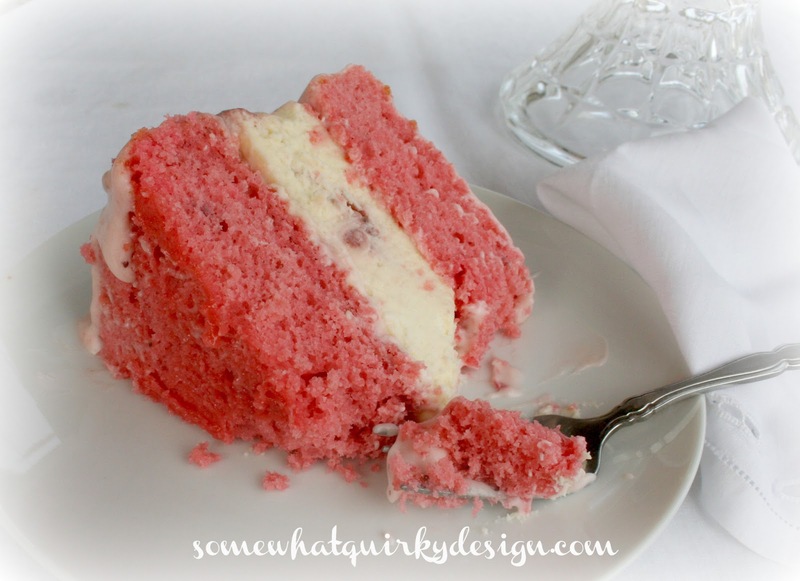 Just Strawberry Swirl Cheesecake Cake. This cake should be your next special occasion cake. For most of you that would be Mother's Day. For me - any day is a cake day. This is a cake I stole (with permission) from Robin@Bird On A Cake. If you are not familiar with Robin's cakes I advise you to get familiar with them. This is also the cake I picked from all my Pinterest cakes for my sister to make for Mr. Quirky's birthday last month while we were visiting there. And it is the cake I made last week. The one that tasted wonderful, but was too ugly for pictures. And I had to give you a recipe for green beans. I had a problem with the frosting you see. Had a little trouble keeping it on the cake. I've had this problem with strawberry frosting before. But the frosting in Robin's pictures looked perfect. I thought that if I just followed the recipe my frosting would look just like hers. But alas. It did not. It did not look like hers. Or my sister's - the one she made in March. But it was good. And I ate it - or a lot of it. Then I made another one. It tastes even better than the others. And I made the frosting with less strawberry puree. And it was still saggy. So I added more sugar. And it thickened up nicely. So I put it on the cake. Would you just look at this? Do you see what I see? (besides that I didn't blend the cream cheese and butter effectively) Looky there - you can just see the frosting melting down the sides of the cake. Perhaps for the rest of my life. Unless someone can help me. Can you help me? You MUST try this cake. Just look at all that moist gooey deliciousness. This is how you make your own. I guarantee it will be wonderful. I can't guarantee the frosting will be pretty, but it will be wonderful. Preheat oven to 325 degrees. Line the bottoms of two 9 inch round cake pans with wax paper, and spray the sides with cooking oil. In a large bowl, combine cake mix and gelatin. Add water and oil; mix on medium speed until well combined. Add eggs, one at a time, beating well. Add strawberries and beat until blended. Pour into pans and bake for 20-25 minutes. Heat oven to 450 degrees. Line the bottom of a 9 inch springform pan with wax paper; spray the sides with cooking oil. Use an electric mixer to beat cream cheese and sugar together. Mixing by hand, add the eggs one at time. Blend in vanilla. Pour half of the cheesecake batter into the prepared pan. 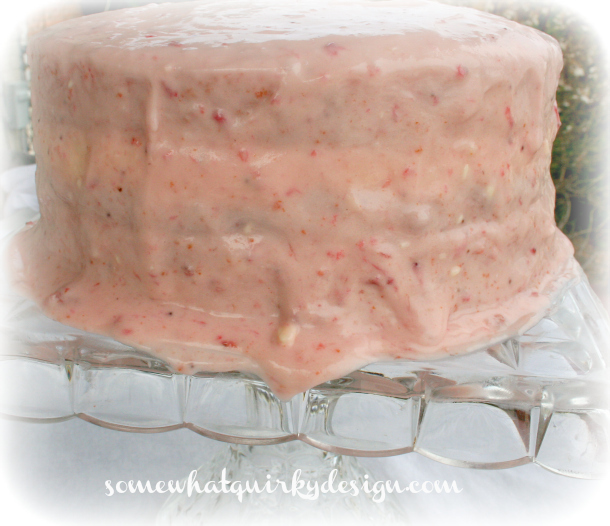 Mix 2 tablespoons of sugar with the pureed strawberries. Drop puree by spoonfuls on top of the batter. Drag a knife back and forth through the batter to swirl in the puree. Pour the rest of the batter in the pan and smooth the top. Bake for 10 minutes. Reduce oven temperature to 250 degrees and continue baking for 45-50 more minutes. Remove from oven and run a sharp knife around the edge of the pan to release the cheesecake. Cool completely in the pan, then chill in the refrigerator. In a large bowl, beat cream cheese and butter until creamy. Beat in strawberries and vanilla. Gradually add sugar, beating until smooth. Remove the sides only of the springform pan, level the top of your cheesecake and trim off any brown edges. Level and trim your cake layers. Place one cake layer on a cake stand. Cover with a thin layer of frosting. Invert the cheesecake on top of the cake layer, remove the bottom of the pan and the wax paper. Cover cheesecake with a thin layer of frosting. 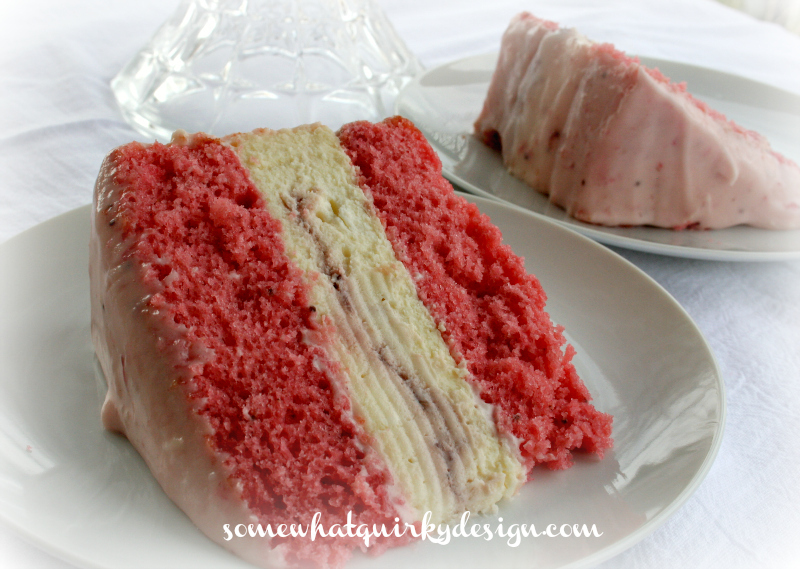 Top with the second layer of cake and spread frosting over the entire cake. Try not to let your frosting sag. 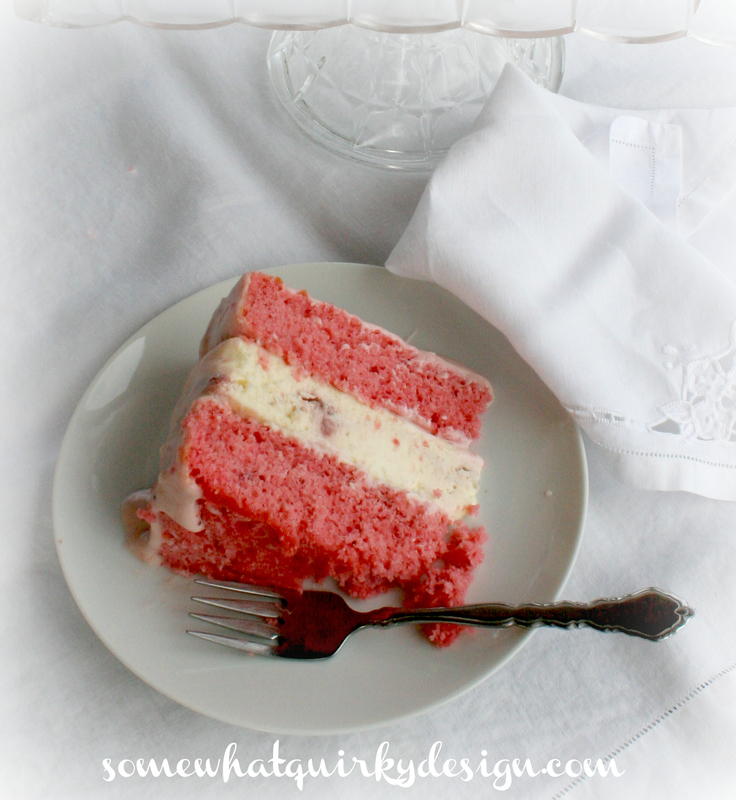 I read somewhere that the best strawberry frosting is made with freeze-dried strawberries. They say that you can find them in the produce section where all the dried fruits are. They also make the frosting really pink. Thanks to Robin for letting me share her recipe. I encourage you to check out some recipes over at Bird On A Cake - like this one for Hummingbird Cake with a tutorial for a beautiful petal frosting design - or this one for Oreo Cookies and Cream Cake - or this one for Orange Creamsicle Cupcakes - or this one for Reese's Peanut Butter Chocolate Cake - or better yet, just go to Bird On A Cake and search for your favorite flavor, or try a new flavor. You will want to try them all. OMG, Karen. This looks like cake made in heaven. I want, I want, I want. I think I will make myself this cake for Mother's Day. It's beautiful to look at and I bet it tastes divine. Thanks for sharing it with us. I think you are too hard on yourself. It's beautiful. I pinned it. I fear I too will have the dreaded SFS, but I'm going to make it anyway. I'm pinning it too! My birthday is ON Mother's Day....surely to God someone will make this for me if I beg. If not...I'll make it for myself! I'm sitting here in Arby's reading this and I giggled right out loud when I came to the picture of the dripping frosting. Sorry, I couldn't help myself. It so reminded me of myself and cakes. 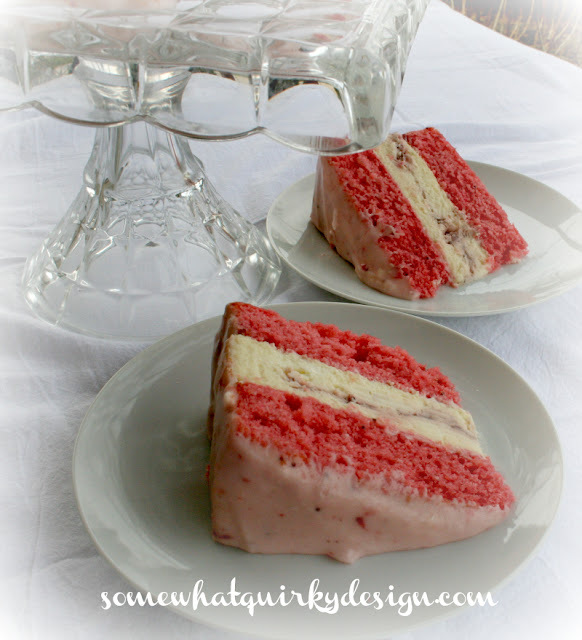 I make cakes in a 9x13 pan for this reason ;) It does look scrumptious! I wonder how it would taste in my 9x13 pan lol! that looks amazing!!! I wouldn't care if your icing was dripping! :o) I came over from whipperberry. Happy Friday! Hello! I found you through Carole's Chatter and her Friday cake linky. So glad I did. Your cake looks scrumptious.